I have mixed feelings about these free business templates Paula Scher just designed for HP. On one hand, she’s helping to improve the look of small business — a landscape dominated by clumsy MS Word and Publisher templates. On the other, she’s contributing to the false notion that you don’t really need a relationship with a skilled designer to create your identity: beautiful letterheads and business cards tailored to your company can just come straight out of the computer with no professional input at all. But what puzzles me most is why Scher chose Helvetica for two of the five templates. She seems to avoid it in her own work, and hated on it pretty openly in the Helvetica film, in which she called it the typeface of the conservative establishment and (jokingly) the cause of the Vietnam and Iraq wars. Perhaps it’s her subversive way of saying that if you’re a business that uses templates for your identity, you are part of the establishment. So, here, have Helvetica — it fits you. Perhaps its her subversive way of saying that if you’re a business that uses templates, you are part of the establishment. So here, have Helvetica. It fits you. I’ll buy that reasoning. I don’t always like the typefaces that I use, but some are just appropriate. The HP templates are potentially something that everyone can use. Sounds like a job for Helvetica to me. Helvetica vs comic sans… One typeface may say “you sold out to the man”, but the other is a visual assault on the eyes. sadly it’s not always up to the designer what face is used…even prestigious designers. someone somewhere probably said use helvetica…aside from the fact it’s a common face that most users (in this case) will have so they can match it…opposed to franklin gothic. which funny enough most people who use the templates probably wouldn’t know, let alone see the difference even if the two were on the same page. we’ve fallen into a real sad time for print design and typography i’m afraid. I’d guess she did it to be snide, in a subtle, subjective, designer-y way. Having read her writing about her work, it would fit. As for being a sell-out? She does commercial and corporate ID for a living. The vast majority of designers don’t ‘sell out’. That implies that we seek to do something other than be bought in the first place. Subversive gets my vote. Kind of in the same way that antebellum spirituals were sung openly, but were in fact laden with pointed subversive messages. I must admit i share your mixed feelings concerning the idea of creating Free business templates. This gives the false idea that choosing your business identity is as easy as choosing a christmas card. I reckon it might work well for newbie design students though. It could give them an idea how to design for a certain company (I know i would have liked it). It reminds me of the chapter in ‘Stop Steeling Sheep’ where they try to explain Angry and Happy with different fonts. Hmm. I tried this out, but I really don’t see much difference between this and various MS Word templates. In some ways, its even less usable, as they’re just downloadable PDFs. Do I print these and use them in my, um, typewriter, then? Clearly this is more a splash for HP printers (which I have and enjoy). We humans are a group of lockstep individuals. We want to be perceived as cool and normal at the same time. Helvetica is the perfect choice for the conflicted. Well put, Randy. As good as any quote in the movie — and it was full of pithy stuff. My best guess is that these fonts were selected because everyone has them. If they are free, and will be made available in an editable format, then those “templates” would have the same common denominator as, say, a webpage. I think these templates are a horrible idea. The same thing is happening on the web right now with the whole “Web 2.0” plastic-look going on. When the bar is lowered to include “cookie-cutter” as a viable alternative, it takes ten-seconds too long to figure out if what you are looking at is a real business – or some highschool kid. Again, it isn’t that what we are looking at IS a viable alternative. It is the lowering of the bar that simple confounds the viewer. Perhaps it’s her subversive way of saying that if you’re a business that uses templates for your identity, you are part of the establishment. So here, have Helvetica. It fits you. Anyone want to guess the source? I don’t want to guess, but I’d like to know. i guess it would have been more interesting instead of imagining static letterheads that could eventually fit to what the designer thinks “small business companies” might need or enjoy as letterheads to let the user combine different things as a lego game, for example, or make some randomness happen in the page maybe (not possible in a pdf, right, it should have been some web app in this case i guess). In this situation she would have been more in the position of a designer i think. What i mean (and i hope i’m clear enough) is that, it’s Scher position as a designer that is questionable in this case; and i think what you describe Stephen as problematic, is the result of that and not the cause. Anyway i think we all agree those pdf won’t be used anyway, but it do nothing to help people understand what a designer can help them in their business. The quotation above was Beatrice Warde talking about Eric Gill’s gift of Gill Sans to industry, 1933. So if Helvetica and sterile one-fits-alls are overtaking the primary school publisher look, doesn’t this mean good things for us? Maybe the fact that these templates are available means that when clients come to us for business cards we are challenged to produce something beyond this? That this is no longer the safe look, but the unsophisticated look? That we might be able to produce something relevant to them that excites us? Go the templates I reckon- if it means that we have to do less of it, I’m all for it. While I think it’s great for Scher to promote the value inherent in having well-designed material, and she states on the pentagram blog that “No template is a substitute for hiring a professional designer” (where she also apparently is slamming Comic Sans, not Helvetica, at present), HP is the same company that created and powers Stinkylogo.com, a cheap, fast designers-crammed-into-a-dark- room-and-forced-to-create-an-entire- brand-identity-in-one-week-for-peanuts-sort of place. How does Scher reconcile promoting good design when her presence at HP helps to legitimize the dark underbelly called stinkylogo.com? Good design can come cheap, but do you really think someone can create something perfect for a client with almost no research into their business, in under a week? I must say, at a first glace these remind me of a few of the presets in Apple’s Pages which also makes use of Helvetica (Neue, especially, if memory serves me right). 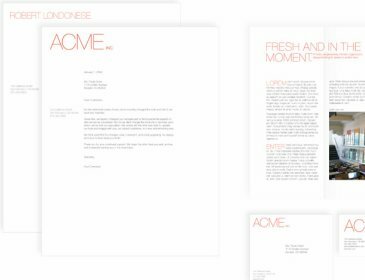 When I first saw some of the letter templates in pages, I thought “hm, this looks pretty nice,” but I haven’t seen them used extensively in any way. What we could end up with was the godawful Pagemaker 1 look, where boxes with rounded corners suddenly were EVERYWHERE. anyway the name of the site is true : logos that stinks ! I think the templates offer an opportunity to appreciate design at its basic level. If anything Scher may be helping good design reach a wider audience or a wider acceptance. The templates are very, very basic. But design wise, thought out, balanced and professionally designed by a well-respected designer. That ultra simplicity offers the user of a very clean but safe design for when time, budget and other factors simply do not allow for the hiring of a pro-designer. Perhaps that simplicity, that bare-bones design inspires the user(s) to consider a higher level of design and detail. The templates could be the first step for people to appreciate better design. As for HP’s Stinkylogo, its debatable. On one side you have decent templates making it out to the world. On the other and more important side, template sites do promote a devaluation of the effort of design and the profession in genral. It also makes non-designers or people, organizations that do not understand the complexity of design to think that design doesnt require time or much thought and/or effort. Thats the biggest danger to the profession. But HPs site and others of its ilk are non the only ones at fault. Computers and graphics software in general promote super-fast graphic design. And if you’re fast on the computer the better to their eyes! People that do not understand the design process often plan out projects and create deadlines that literally do not consider a design process. Thus enters these templates. Its a shame and something that needs to be addressed in the design community. Especially from input and support from elder designers such as Paula. I realize this is an old article, but I thought it worth mentioning that Scher has answered this question several times: She originally designed the HP templates with Gotham, but H& F-J wouldn’t agree to embedding it due to the probability that it would get ripped off; they didn’t want that since it was/is their top-selling typeface. Thus, Helvetica was her choice. However, that still doesn’t answer: Why not use something else? To my knowledge she has not answered that question sufficiently. She just says it was “the obvious choice” for the requirements. And I can understand that. Something else strikes me, though. Why have very few gotten upset at Apple’s templates in Pages? Sure, they’re better, but it’s the same theory — democratizing design sans the individualized partnership with the designer. Does the same sentiment exist concerning Apple? Most will not pay for a designer, but would still like a professional look for their business. And many just can’t afford it now; they may be in the beginning stages, so they teach themselves, and often that starts with studying work that is already well done, such as a template designed by a professional. I’m okay with that for a short season. Hopefully the time will come when they realize they need to progress past that initial and elementary step.